, eari of Sandwich, an English general, admiral, and statesman, was the only surviving son of sir Sidney Montague^ the youngest son of Edward lord Montague of Bough ton. He was born July 27, 1625, and after a liberal education was very early introduced into public life. His career may be said to have commenced at the age of eighteen; for in August 1643 he was commissioned to raise a regiment in the service of the parliament, and to act against Charles I. He then joined the army, and acquitted himself with great courage at the | storming of Lincoln, the battles of Marston-moor and Naseby, and on other occasions, before he had arrived at his twentieth year. He sat also in the House of Commons as representative for Huntingdonshire before he was of age, and had afterwards a seat at the board of treasury under Cromwell. After the Dutch war he went from the army to the navy, had a command in the fleet, and Cromwell had so good an opinion of him, as to associate him with the celebrated admiral Blake in his expedition to the Mediterranean. In 1656 he returned to England with some rich prizes, and received the thanks of the parliament, as well as renewed instances of Cromwell’s favour. In the following year he was appointed to command the fleet in the Downs, the object of which was to watch the Dutch, to carry on the war with Spain, and to facilitate the enterprize of Dunkirk. After the death of Cromwell, he accepted, under Richard, the command of a large fleet which was sent to the North, on board of which he embarked in the spring of 1659. In April he wrote to the kings of Sweden and Denmark, and to the Dutch admiral Opdam, informing them that his instructions were, not to respect the private advantage of England by making war, but the general tranquillity of Europe, by engaging the Powers of the North to enter into an equitable peace; and in the negocrations which he carried on with other ministers to effect this purpose, he is said to have displayed the talents of a consummate statesman. He appears, however, about this time, to have conceived a dislike against his employers for which two reasons are assigned the one, that previous to his sailing, the parliament had tied him down to act only in conjunction with their commissioners, one of whom was Algernon Sidney; and the other, that they had given away his regiment of horse. While thus employed, and with these feelings, Charles II. sent him two letters, one from himself, and the other from chancellor Hyde, the purpose of which was to induce him to withdraw from the service of parliament, and, as a necessary step, to return with the fleet to England, where it might be ready to act in conjunction with sir George Booth and others, who were already disposed to promote the restoration. He accordingly set sail for England, but had the mortification to find that sir George Booth was in the Tower, the parliament in full authority, and a charge against himself brought by Algernon Sidney. | He set out, however, for London, and defended his conduct to parliament with so much plausibility, that the only consequence was his being dismissed from his command. His retirement was not of long duration; and upon the nearer approach of the restoration, general Monk having procured him to be replaced in his former rank in the navy, he convoyed the king to England, who made him a knight of the garter, and soon afterwards created him baron Mon^ tague of St. Neots in Huntingdonshire, viscount Hinchinbroke in the same county, and earl of Sandwich in Kent, He was likewise sworn a member of the privy council, made master of the king’s wardrobe, admiral of the narrow seas, and lieutenant admiral to the duke of York, as lord high admiral of England. When the Dutch war ‘began in 1664, the duke of York took upon him the command of the fleet as high admiral, and the earl of Sandwich commanded the blue squadron; and by his well-timed efforts, a great number of the enemy’s ships were taken. In the great battle, JuneS, 1665, when the Dutch lost their admiral Opdam, and had eighteen men of war taken, and fourteen destroyed, a large share of the honour of the victory was justly assigned to the earl of Sandwich, who also on Sept. 4, of the same year, took eight Dutch men of war, two of their best East India ships, and twenty sail of their merchantmen. 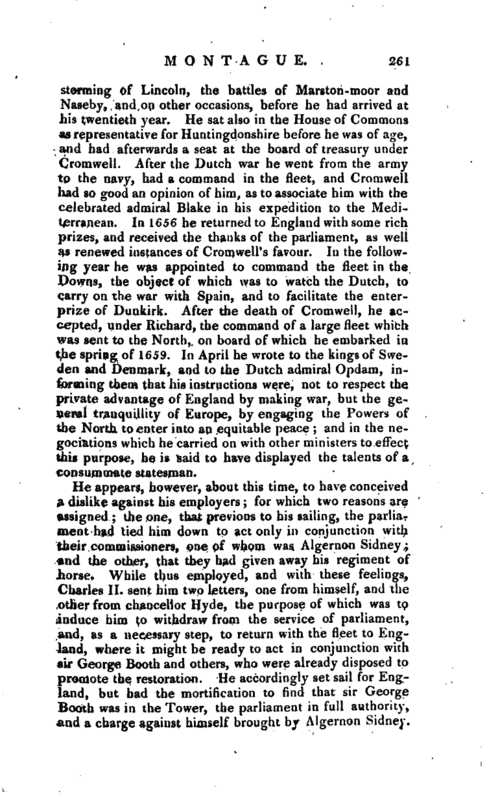 Soon after his return to England, he was sent to the court of Madrid, to negociate a peace between Spain and Portugal, which he not only effected in the most satisfactory manner, but also concluded with the court of Spain, one of the most beneficial treaties of commerce that ever was made for this nation. 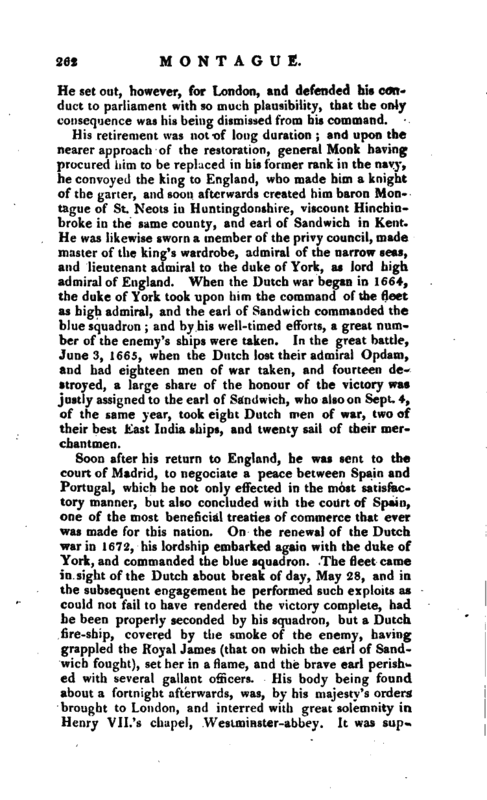 On the renewal of the Dutch war in 1672, his lordship embarked again with the duke of York, and commanded the blue squadron. The fleet came in sight of the Dutch about break of day, May 28, and in the subsequent engagement he performed such exploits as could not fail to have rendered the victory complete, had he been properly seconded by his squadron, but a Dutch fire-ship, covered by the smoke of the enemy, having grappled the Royal James (that on which the earl of Sandwich fought), set her in a flame, and the brave earl perished with several gallant officers. His body being found about a fortnight afterwards, was, by his majesty’s orders brought to London, and interred with great solemnity in Henry VII.’s chapel, Westminster-abbey. It was | supposed by many, though unjustly, that the duke of York did not support him as he might have done towards the beginning of the action; but it was agreed by all, that sir Joseph Jordan, the earl’s vice-admiral, might have disengaged him. 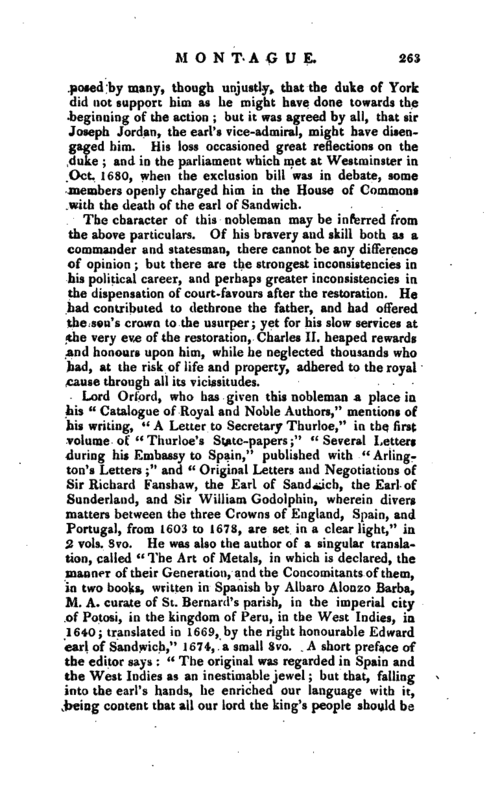 His loss occasioned great reflections on the duke; and in the parliament which met at Westminster in Oct. 1680, when the exclusion bill was in debate, soma members openly charged him in the House of Commons with the death of the earl of Sandwich. The character of this nobleman may be inferred from the above particulars. Of his bravery and skill both as a commander and statesman, there cannot be any difference of opinion; but there are the strongest inconsistencies in his political career, and perhaps greater inconsistencies in the dispensation of courf-favours after the restoration. He had contributed to dethrone the father, and had offered the son’s crown to the usurper; yet for his slow services at the very eve of the restoration, Charles II. heaped rewards and honours upon him, while he neglected thousands who had, at the risk of life and property, adhered to the royal cause through all its vicissitudes. 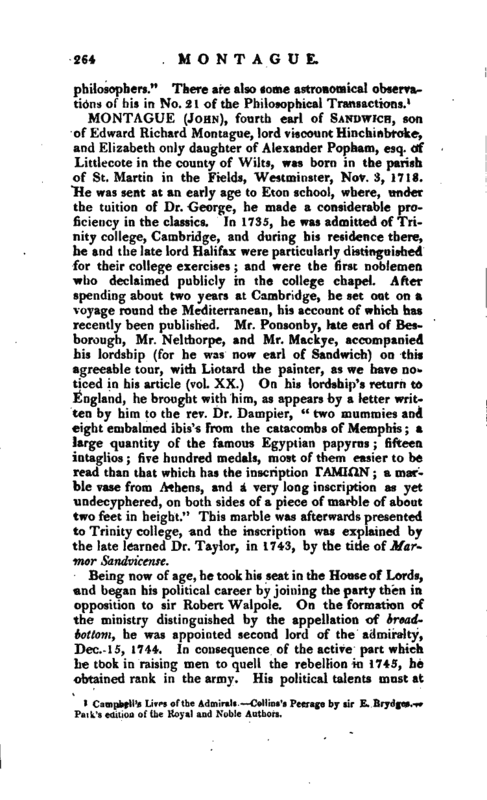 Campbell’s Lives of the Admirals. 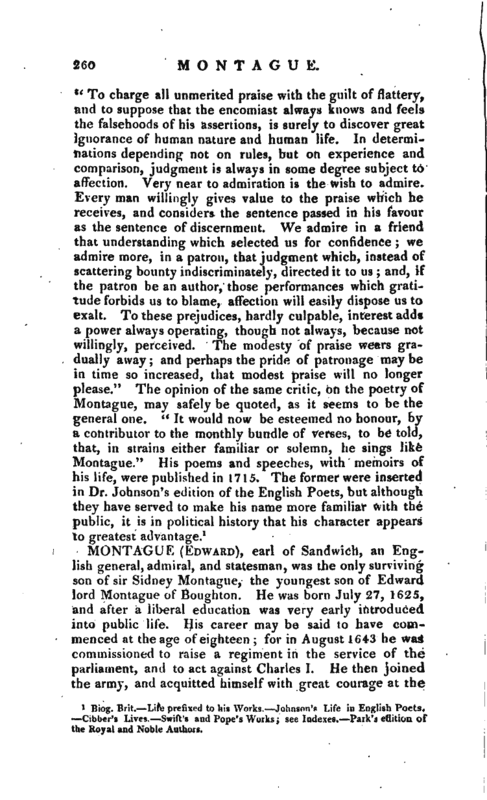 Collins’s Peerage by sir E. Brydges. Park’s edition of the Royal and Noble Authors.